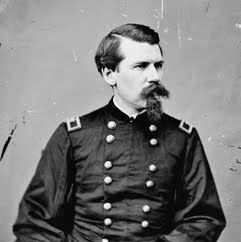 Horace Porter was an American soldier and diplomat who served as a lieutenant colonel, ordnance officer and staff officer in the Union Army during the American Civil War, personal secretary to General and President Ulysses S. Grant and to General William T. Sherman, vice president of the Pullman Palace Car Company and U.S. Ambassador to France from 1897 to 1905. In 1866, he was appointed to the brevet grade of brigadier general, United States Army.